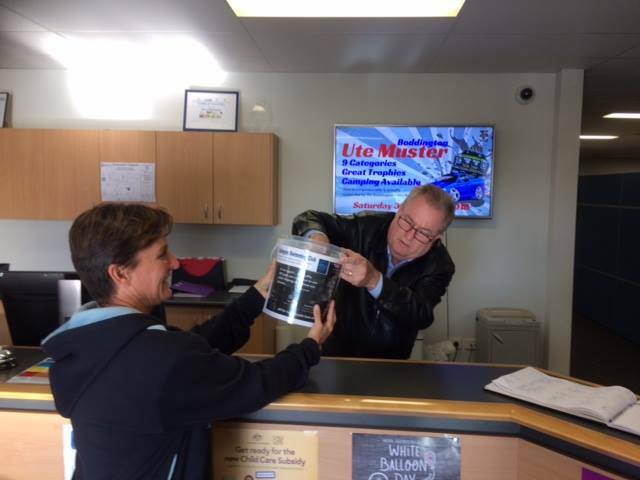 Chris Littlemore, CEO of Boddington Shire Council, drew the winning ticket this afternoon which was sold by Yvonne Hoskins. Congratulations to #19 - Patrick Maassen of Collie. We hope you enjoy the 2018 AFL Grand Final experience in Melbourne as much as our team will enjoy the experience in Karratha! Thank you to everyone who supported our club. Chris Littlemore, CEO of Boddington Shire Council drawing the lucky winner. And the winner is .. Patrick Maassen of Collie! Click HERE to purchase your ticket/s online! Or email store.boddswim@gmail.com for information on buying tickets directly from one of our club members. 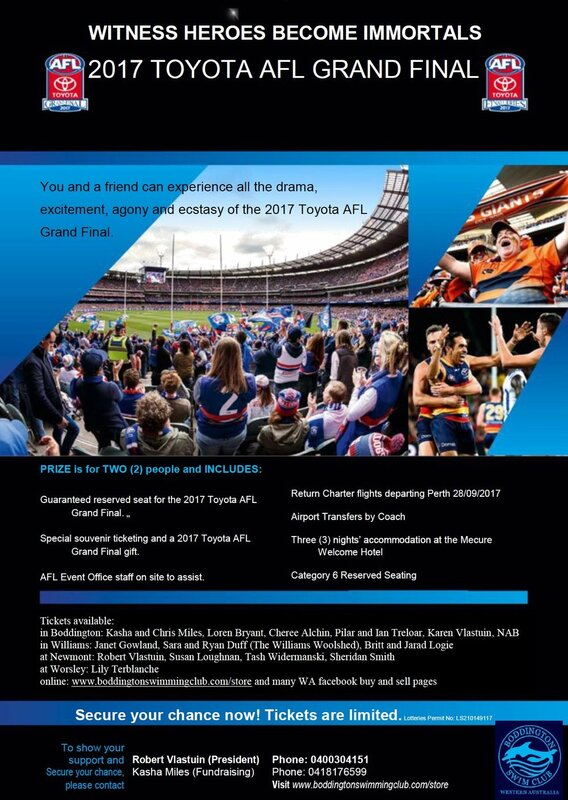 2017 AFL Grand Final - Raffle tickets on sale! Your support helps our young swimmers achieve their dreams! Boddington Swimming Club were the proud recipient of a recent Australia Day award. The club was recognised in the Active Citizenship Award category. Thank you to all who put in time and effort so many different ways to help make our club awesome. Thank you also to those who believe in what we do enough to nominate us for the award. Karen Vlastuin - Head Coach (centre) accepting the award. JX Results 2015-2016 Swimming Australia set a benchmark for younger swimmers called the Junior Excellence program (otherwise known as JX). This program is based on times which are set out in a tiered system (Tier 1 – Tier 4) and there are four levels of achievement: Gold, Silver, Bronze and Green. 9-10 year olds Gold: At least one Tier 1 time in any of the specified events. Silver: At least one Tier 2 time in any of the specified event. Bronze: At least one Tier 3 time in any of the specified event. Green: At least one Tier 4 time in any of the specified event. 11-13 year olds Gold: At least one Tier 1 time in two or more of the specified events. Silver: At least one Tier 1 or Tier 2 time in any of the specified event. Bronze: At least one Tier 3 time in any of the specified event. Green: At least one Tier 4 time in any of the specified event. 14-16 year olds Gold: At least one Tier 1 time in three or more of the specified events. Silver: At least one Tier 1 or Tier 2 time in any of the specified event. Bronze: At least one Tier 3 time in any of the specified event. Green: At least one Tier 4 time in any of the specified event. The Program recognises performances from 1 April 2015 to 31 March 2016. Where a child races in both age groups within that time period, he or she will receive a JX reward depending on the highest standard achieved in either (not both) of those age groups. Green: Ariana Alchin, Samuel Alchin, Natalie Ferguson, Michael Gentle, Noah Logie, Kele Readhead. We would like to recognise these swimmers by presenting them with their JX Pack at our Game Day this Saturday. Presentation will be made at 9:00 before we start the days activities. If you are unable to attend, the pack will be made available next week. The Department of Sport and Recreation has been creating an online application process for individuals to apply for KidSport. Hard copies will still be available, but from 14 November 2016, parents and guardians will be able to use the online form if they hold a valid Health Care or Pensioner Concession Card. Click here for more information or to register online from 14 November 2016. Due do some delays with pool maintenance works, we still have no firm date for the opening of the Boddington Pool. This has made it very difficult to plan both swim club and swim school in this first half of the season and has impacted several plans and program budgets. To enable some form of training to occur, we have hired lanes at the Narrogin indoor heated pool and training will commence Thursday next week, 13th October. Training will continue in Narrogin each Thursday from 4:00pm for those who school in Narrogin and 4:30 for anyone travelling from Boddington, until the Boddington pool is open. Once our local pool is open our squad system will be implemented. This will see members grouped by interest (recreational or competitive) and age for more effective coaching and hopefully a more enjoyable season for your child. All groups will receive the same stroke correction/development and quality coaching. Training sessions will be offered Monday, Wednesday and Thursday afternoons and Friday mornings with our Junior Dolphins on a Friday afternoon. Our new Game Day Series will take place once a month on a Saturday morning. These Game Days will encourage the whole family to get involved. Boddington Swimming Club is registered with KidSport again this year. If you qualify and would like further information, please see our website or catch up with Simone at the Shire. Vouchers (up to $200 per child per year) can be used towards membership and club uniforms and equipment. Remember, your membership and uniform purchases can be done online this year in our new Web Store. I look forward to seeing you all again at the pool. 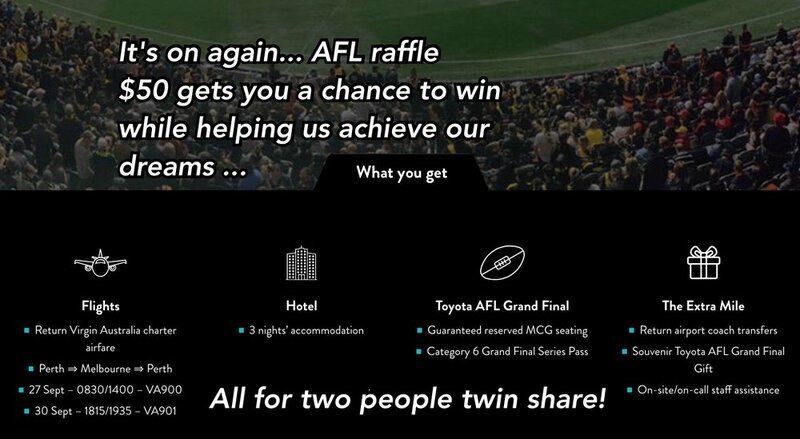 AFL Raffle - And the winner is....!!! Congratulations TRACIE and thanks Natasha Widermanski for selling the winning ticket. Thank you to everyone who supported the Boddington Swim Club kids by buying a ticket.